As a person who never saw a single episode, yes, even five minutes of the Doctor Who series, it was refreshing to give a look at it for the first time with BBC’s lost and recovered, but never forgotten six episodes from the previous century. It was the completely missing third serial of the fourth season of series Doctor Who, which was first broadcast in six weekly parts from 5 November to 10 December 1966. 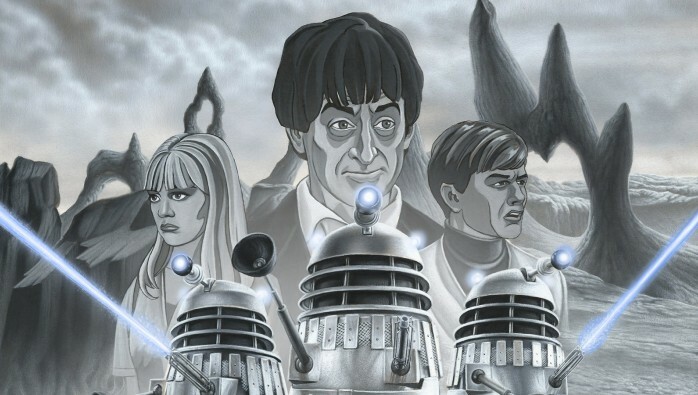 Now imagine how nostalgic you can feel if you watch the black-and-white version of Doctor Who’s animated series now on the big silver screen? It begins with Ben and Polly, who, quite stunningly watched the Second Doctor collapse to the floor of the TARDIS and then magically turn into a younger man. While Ben and Polly ask themselves whether the man who appears before them is a real doctor or not, the presumed Doctor does not help either by creating a mystery around his own persona. In the meantime, the TARDIS lands on the plane Vulcan where, as it happens that the doctor becomes a witness of the examiner who should have examined the human located in the Vulcan. As the Vulcan investigates, the governor does not pay enough attention to the rebel, and keeps it as insignificant matter, while it’s deputy, Quinn takes a whole different approach by accusing the Doctor in the murder of the examiner. But as the story unfolds, you see the machine called Dalek is being reproduced and multiplied by Quinn whose outrageous agenda is to destroy everyone who will dare to cross his path, including the Doctor. You will have to know one thing before you start watching the favorite franchise, that it does not have the best quality of animation we have nowadays. And of course you should not have expected that at all. Also, having six episodes for the plot we have been introduced to could have been told in three episodes, maximum in four, but I guess back then it was a complete different story, when you needed to drag out an episode as much as you can to bring the audience back to their TVs to watch breathlessly all of doctor’s adventure. In conclusion, BBC’s Doctor Who: The Power of Daleks proves once again that how wrong BBC was by not retaining the copies of the series back then after failing to value it properly. Now, in the 21st century, the modern fans of the series can appreciate it more than it was in the 60s, and that is amazing. The series not only survives, it becomes younger and younger every day, by conquering one heart after another. Even myself, who never cared about the Doctor Who series was amazed by its intelligence and importance to have such a long life. So, in case you’re in Canada, then you certainly should join Cineplex’s celebration of Doctor Who’s lost story’s 50th anniversary. Great review Ulkar! I’m a huge Doctor Who fan and it’s good to hear that new audiences are discovering the classic era of the series, and on the big screen no less! I think the limited animation works in favour of this iconic story, giving it an appropriately retro feel.